Did you know that you can cheat and make BBQ ribs in the slow cooker? Yup, true story. I got an All-Clad slow cooker for my birthday a few weeks ago (thanks Mom & Dad!!) which has been much fun! I had never had one of these gems before and now I’m hooked. How great is it that I can throw a bunch of stuff in there, turn it on as I’m frantically running out the door at 6:45 and have dinner ready to serve when I get home 11 hours later? Let me tell you, its pretty stinking amazing. Enter my really fast but gourmet looking dinner the other night. First, I’ll let you in the the painfully difficult challenge of cooking ribs in the slow cooker (seriously, you’re going to wonder why you’ve never done this before) and then I’ll introduce you to a new fancier version of sweet potato fries. YUM! The night before, generously rub the ribs down on all sides with the spice rub. Cover and refrigerate over night. In the morning, place the ribs in the slow cooker and pour 1 can of Coke over top. Cover and cook on low for 8 hours. 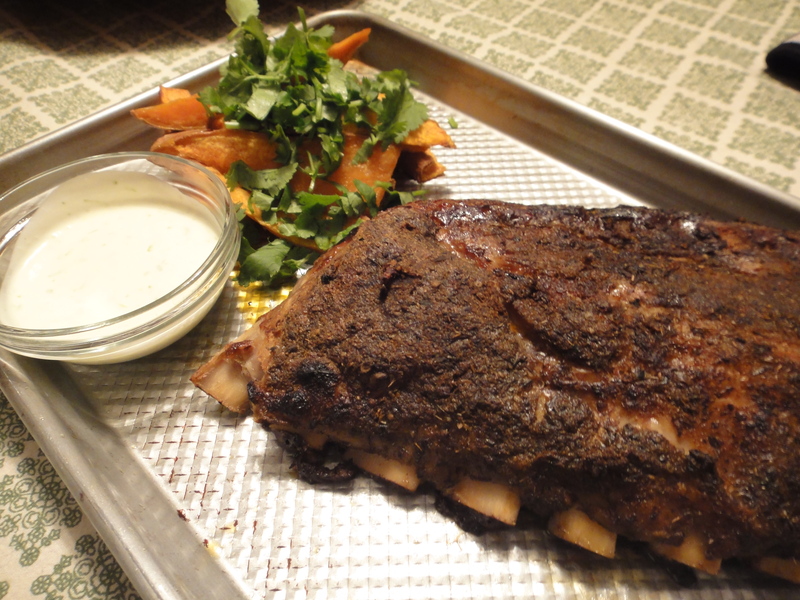 Remove ribs from slow cooker and place on a baking sheet. Place ribs under the broiler for about 5 minutes or until they begin to crisp on top. Serve immediately with your favorite BBQ sauce. We really like this one. Like, a lot (choose the Hickory one). Preheat the oven to 400°. Wash the sweet potatoes but don’t peel them. Cut each lengthwise in half. Cut again lengthwise into quarters and then once more in the same way, so you have 8 long wedges. Place the wedges in a roasting pan that has been lined with parchment paper and brushed lightly with some of the olive oil. Brush the wedges with the remaining oil and sprinkle with a mixture of the ground coriander and salt. Roast for about 25 minutes , or until sweet potato is tender and golden brown. Remove from the oven and allow to cool slightly. The wedges can be eaten warm or at room temp. To make the sauce, very finely chop the lemongrass and grind finely in a spice grinder. Whisk with all of the other ingredients for the dipping sauce and set aside. When ready to serve, place the wedges on a large, flat serving dish. Sprinkle with the diced chile and cilantro and serve with the sauce on the side. No slow cooker in our house, but good lord those look good! The lemongrass creme fraiche has me the most interested. It sounds incredible – lemongrass is one of my favourite ingredients.